Perched upright on a plant stem, this common green darner is easy to recognize by the bull’s-eye pattern on its head. Below the bull’s-eye, its bulging brown eyes are so big that they touch. The main part of a green darner’s body is green. In females like this one, the long “tail,” or abdomen, is rusty brown. In males, the “tail” is bright blue. A green darner’s four wings are clear with yellow on the leading edges. Seasons are changing, and migrations are under way. Not only are birds and monarch butterflies on the move, but surprisingly, so also are certain dragonflies. Common green darners (Anax junius) are among the many dragonflies we see in Westborough. They’re big, with a wingspan of 5 inches. “Helicopter” is likely to pop into mind when you spot one flying above the garden, a field, or a wetland. Green darners are strong fliers, which makes it possible for them to migrate. 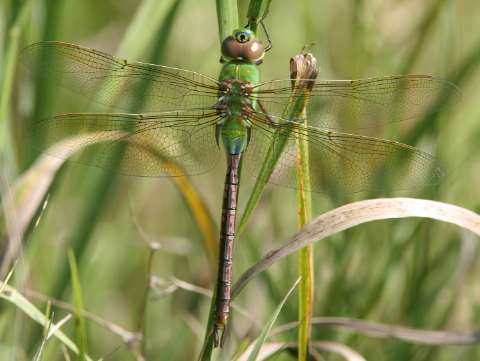 Like birds, migrating green darners travel long distances – for example, from here to Florida. Their long flights are wing powered, but these dragonflies also save energy and gain speed by riding the winds aloft. Hitch-hiking on the wind, they can reach speeds of 50 miles per hour and travel 85 miles in one day. But wait – dragonflies migrating? How do we know this isn’t a joke? We know because researchers have recently been studying green darner migration. Scientists from Princeton University and Rutgers University became curious when they noticed large numbers of dragonflies passing Cape May, N.J., along with vast numbers of migrating birds and monarch butterflies. Fortunately, the green darners weren’t bothered by the added weight of the transmitters, which weigh about a third as much as a paper clip. These dragonflies are used to carrying prey larger than they are, and they’re also strong enough to fly around for hours in tandem with a mate. So what did the researchers find out? The dragonflies tend to set off on their fall migration after the temperature drops for two nights in a row. Like many birds, they move with the weather, such as a cold front that brings tailwinds blowing toward the southeast. They follow the coastline on their trip south, but like small birds, they head inland to avoid crossing wide stretches of water, such as Delaware Bay. Dragonflies travel during the day and rest overnight in trees. After a travel day, they often stay in one place for a couple of days. If it’s rainy or too windy, they stay put. As green darners proceed south, they feed along the way, especially at stopovers. They consume a lot of their favorite food – mosquitoes – just as they do up north. And they themselves may also become food for migrating birds, such as American kestrels (Falco sparverius), which are small falcons. Migrating kestrels follow swarms of migrating dragonflies, feasting as they go. What about the return trip? The green darners that reach Florida reproduce there and die. Their offspring return to northern swamps to breed in the spring. In this way green darners are somewhat similar to monarch butterflies (Danaus plexippus), which migrate to Mexico but die before returning to northern locations, leaving it to the next generation or two to complete the round-trip. How do dragonflies navigate during their migration? Their excellent vision helps them to follow the coastline and landmarks. Like birds that migrate during the day, they may also use the sun. There’s still much to be discovered about this question, whether we’re talking about birds, butterflies, or dragonflies. Do all green darners migrate, including those in Westborough? Nobody has tracked our local green darners, so it’s hard to say. But in general, some but not all green darners migrate. Some stay put and breed locally, generation after generation. On one hand, green darners that don’t migrate typically lay eggs in the stems of plants in local swamps in mid-summer. The eggs hatch into an immature stage called a nymph, which lives and feeds underwater. These particular nymphs develop slowly, spending nearly a year underwater (or even longer). They survive under the ice during the winter and emerge as dragonflies in early summer of the next year. On the other hand, migrating green darners arrive from the south in the spring, and they, too, lay eggs in the stems of plants in local swamps. But their nymphs develop quickly. They spend only 3 months underwater. Then they emerge as dragonflies in late summer and set off on their migration in August or September, to breed in the south. With these two different lifestyles, green darners are somewhat similar to familiar birds such as our robins, bluebirds, Canada geese, and even red-tailed hawks. We tend to think of these birds as departing south for the winter (and many do), but some of them also stay here year-round. In January you can sometimes find robins in the woods behind Stop and Shop and bluebirds in the fields at the Westboro Wildlife Management Area off Rt. 135. The scientists who study migrating dragonflies believe that it’s important to understand why and how various creatures migrate. They think it will help us to predict changes that come with climate change, such as global warming. In Westborough we can see green darners from mid-April, when the first migrants arrive from the south, through mid-November, when frosts kill them. Look for adults feeding over fields and meadows, where other insects are plentiful. Green darners breed in swamps and ponds with plants growing out of the water. Are green darners the only dragonflies that migrate? No, but they’re the most common migrants. Other migrating dragonflies in our area include twelve-spotted skimmers (Libellula pulchella), black saddlebags (Tramea lacerata), and wandering gliders (Pantala flavescens). How common is it for dragonflies to migrate? Not very. Of the 445 kinds of dragonflies in North America, only 9 migrate regularly. That’s only 2 percent. To find out more about green darners and their migration, get the lovely book A Dragon in the Sky: the Story of a Green Darner Dragonfly by Laurence Pringle, written for both kids and adults. It’s available at the Westborough Library.